This has been a busy week for picking dewberry fruit. Each day was a new experience. At first there were hardly any ripe fruit and I would have to search the entire patch to fill even part of my bucket. Each bush would provide only a few ripe berries. Almost every day I picked dewberries. Each day there were more and more fruit to pick. Every day I was excited to place fruit in my bucket. 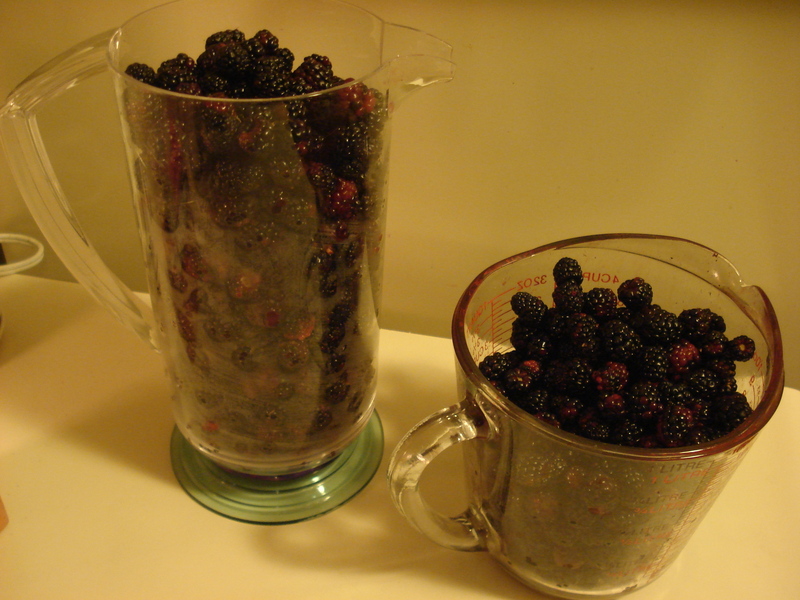 Saturday I picked for two hours and came back with two gallons of dewberries. That brought to a total of 5 gallons of dewberries. Time to stop picking dewberries and time to start juicing them up. As I picked I marveled at how these fruit survive in areas where they have wet feet and in areas where there has been no water for months. “My” patch had plenty of water so it has ripe fruit weeks before those without moisture. When I first started looking for dewberries I was not sure what distinguished dewberries from blackberries. 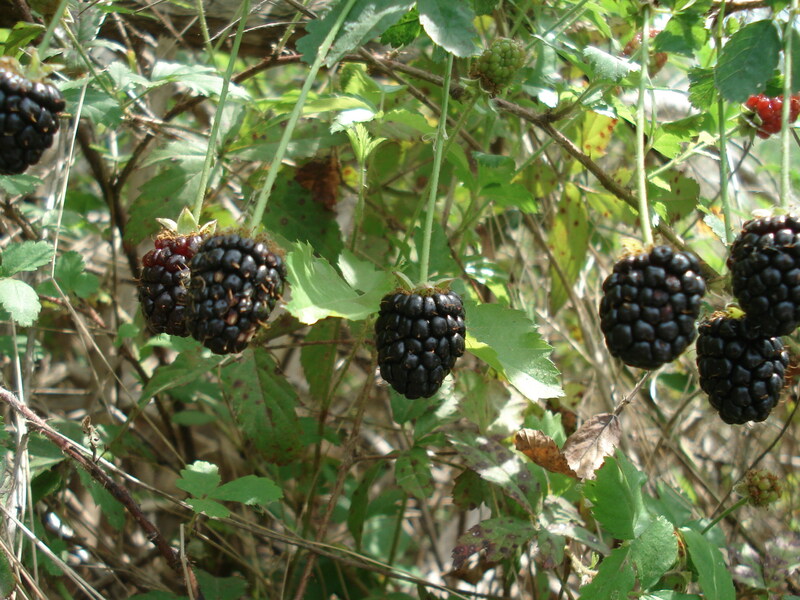 Dewberries have trailing vines while blackberries have arching canes. I decided to juice up all but one batch of my dewberries. The ones I don’t juice up I am going to make into jam rather than jelly. Although one can crush the fruit and then run it through a cheese cloth, I chose to use my juice for convenience sake. I still will run the juice through cheese cloth, at a later date, to remove some pulp that the juicer allows through. I then froze the juice into gallon ziplock bags. I mark the type of juice, date, and quantity. I try to put 4 1/2 cups of juice since I will need 4 and I will lose some when I remove the pulp. 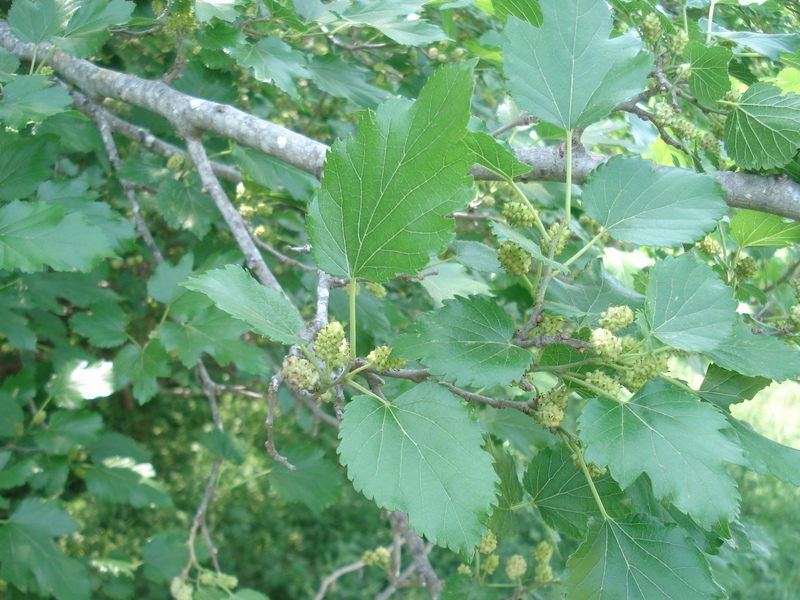 I have been on the lookout for mulberry trees. The tree has a distinctive look to it that makes it easy to spot. I find that the best place to look is along fence lines, especially in abandoned lots and fields. Keep an eye on the birds too for they flock to the fruit. Today I drove by a nice patch of red mulberry trees on the way home from my Sunday tacos. So as soon as I could change into my berry picking outfit I headed over to where I had seen the trees. Although they are called red mulberries they have black fruit when ripe. They resemble the dewberries but have a green stem that remains on the fruit after picking. The ripe fruit were all over the ground but I only use the fruit that is ripe on the tree. I tasted a few and they had a great sweet taste. Sometimes they are too watery but this specimen was just right. 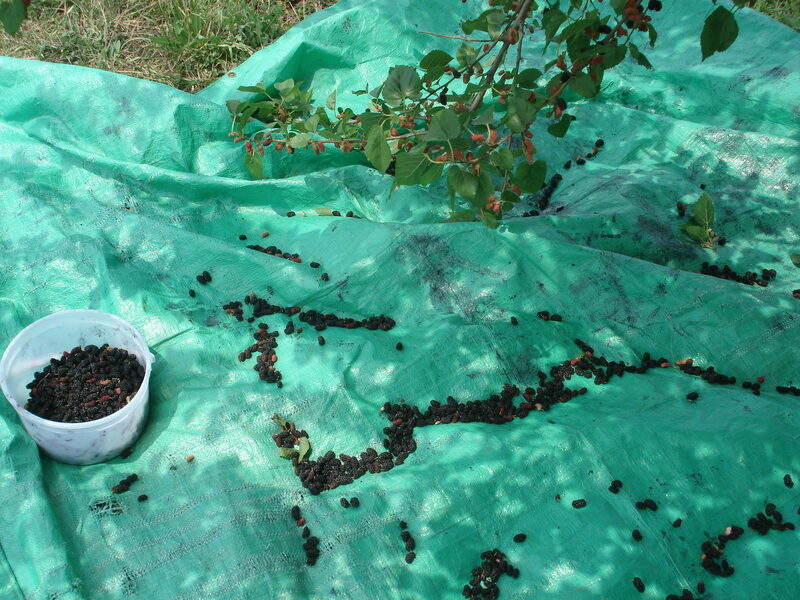 To pick mulberries I place down a tarp and then shake the tree branches onto the tarp. Some leaves and branches fall onto the tarp but they are easily removed. I tip the tarp to get all the fruit to gather in one spot. Within a short time I filled up my gallon bucket. Sadly I didn’t bring along another container so I had to stop before I had finished with the entire tree. The birds will thank me because they flocked back to the tree the minute I started to leave. Although I had a full bucket I decided to check out some white mulberry trees. 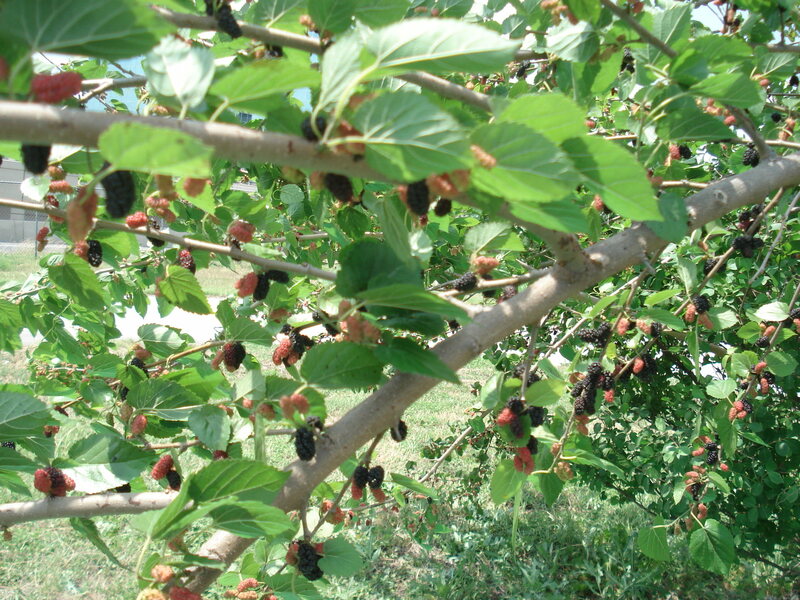 These mulberries were not natives but introduced from China in an attempt to grow silk. They produce a white, slightly pink berry. They had even a better taste than the red mulberries. Unfortunately they seemed to be behind the red mulberries in the ripening process so I only was able to collect two cups of fruit. When I juiced them up at home they gave me a muddy colored juice that I didn’t find appealing. It did make a better tasting juice than the red mulberries. I think I will mix it with some of the dewberries. 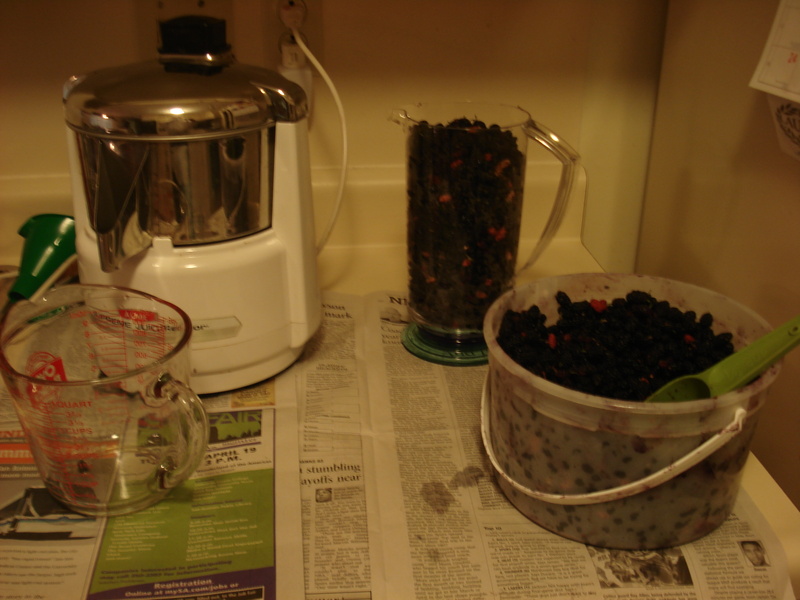 I juiced up the mulberries this evening. I added a wide mouthed funnel to my assembly to make feeding the berries into the juicer less messy. 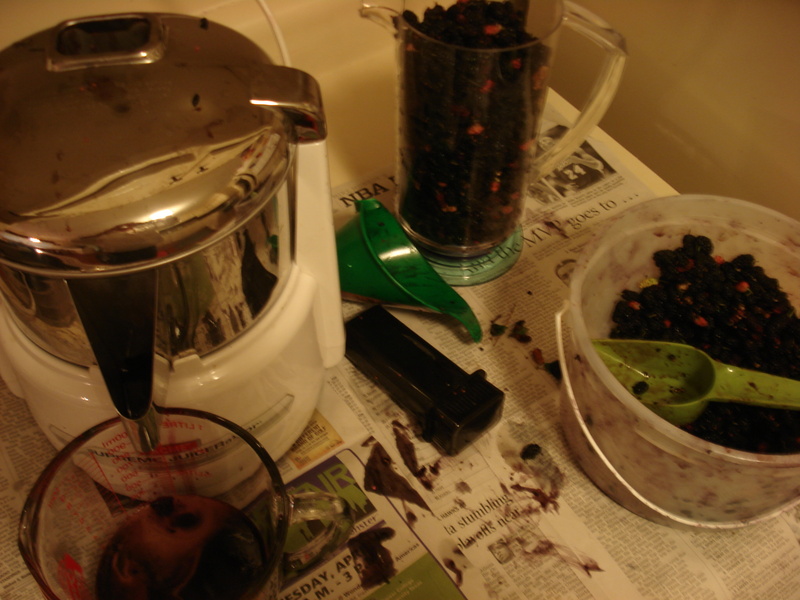 I also decided to put down newspapers under the juicer because the mulberries stain my counter. It took about 10 cups of fruit to make 4 cups of juice. 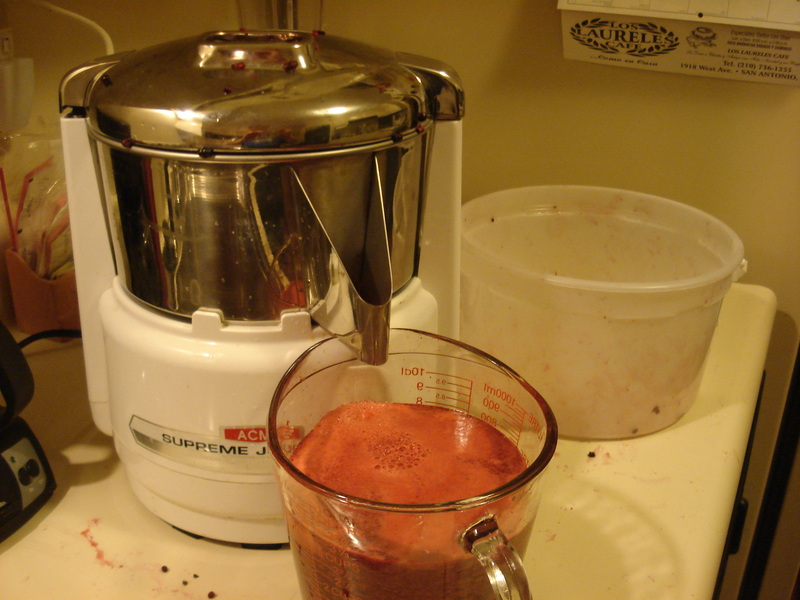 The red mulberries made an attractive juice that should make an interesting jelly. The jelly process I am saving for another day. Gallery | This entry was posted in Recipes and tagged blackberries, dewberries, dewberry jelly, dewberry juice, mulberries, mulberry jelly, mulberry juice, red mulberry, white mulberry. Bookmark the permalink. Which berries tasted better-mulberry or dewberry ? Depends on what you like I suppose. Dewberries are tart whereas the mulberies are sweet. Personally I prefer the dewberry but I suspect it is that the texture of mulberry is less to my liking. I don’t like the stem end that remains on the berry after it is picked. Mulberries are a whole lot easier to pick because you can shake the tree and they don’t scratch you. 🙂 The white mulberry has even a better taste than the red mulberry but the color of the white mulberry juice is the color of mud. I was going to make jelly out of the white mulberry but the color prevented me from trying it. So I added the juice to one of the batches of dewberry juice. Since the dewberry juice is dark purple it didn’t change the color any. Originally fm Houston, but now in Austin. Are there places to pick dewberries around Austin? Thanks! Look along railroad tracks, older field or abandoned lots. They can be at the edges of woods, and along roadways. Frontage roads of the expressways often have many dewberries. If the first place you find them doesn’t have a lot of fruit, harvest what you can, freeze it, and then look for other locations. Once you find some you will have a better idea of where to look. Someone else inquired where the best locality is to pick dewberries. My answer to that is get out walking and keep your eyes open because they are almost everywhere. The best part of jelly making, for me, is in the search for a plant or fruit. Since dewberries have been ripe for several weeks in the Austin area time is important here. Let me know how it turns out. Enjoy. I have been trying to identify a plant that I took some photos of because it has pretty red leaves. I have finally decided that they are dewberries. They are growing along the fence rows along our gravel road. I will have to try to remember to look for fruit next year. The pictures on your website sure look like the dewberries we have here. Now you just have to find out when dewberries ripen next year where you are. They make great jelly and jam.